You may know that Oregon’s Coast is among the most breathtaking in the West, with beautiful state parks sparkling like jewels along its weathered shore, but did you know that all of it, every inch of the 363-mile coastline, is yours to explore? Thanks to the conservation foresight of state leaders like Samuel H. Boardman and Governors Oswald West and Tom McCall, Oregon’s beaches are considered public land. Today, the coastline boasts an incredible array of parks — an average of one every 10 miles. One such jewel in the Coast’s crown is Oswald West State Park, stretching south from Arch Cape for four miles toward Manzanita. A gravel trail passes through old-growth hemlock, cedar and towering Sitka spruce to Short Sands Beach — a secluded cover that is popular with surfers. It’s a great place to explore tide pools or to just relax and enjoy the sunset. The wind-protected beach is flanked by two coastal headlands: the 1,600-foot Neahkahnie Mountain to the south and Cape Falcon to the north. Adventurous hikers will enjoy the 2.5-mile trail to the top of Cape Falcon with panoramic views or a stretch of the Oregon Coast Trail, thirteen miles of which pass through the park. Nature and history collide at Fort Stevens State Park. For 84 years, beginning with the Civil War through the end of World War II, Fort Stevens was the primary military defense installation in the three-fort Harbor Defense System at the mouth of the Columbia River. Today the 4,200-acre park offers visitors a glimpse into history and a wealth of recreational opportunities, from beach combing and paved bike trails to hiking paths that traverse forests, wetland and dunes. You can even walk among the ruins of the famous Peter Iredale shipwreck, a four-mast steel sailing vessel that ran aground October 25, 1906. 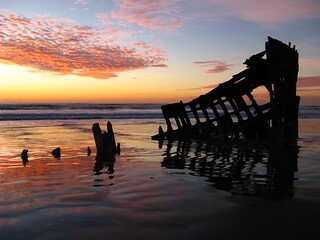 The rusting bow of the ship rises dramatically out of the sands, making a one-of-a-kind photo op. History buffs will enjoy the displays at the military museum, or tours of the gun battery that also served as a World War II command center. To see a complete listing of State Parks along the Oregon Coast, click here.